Last year, about two days after Christmas, my parents and I loaded our suitcases, their two golden retrievers, and the dogs’ beds into their car to drive from their house in Northern California to visit my grandma in San Diego. To miss as much traffic as we could getting out of the Bay Area, we left dark and early before 7 am… We even saw the sun rise from the road! Since all of our alarms rang before 6 am, we decided to briefly stop for coffee and a restroom break about two hours into our drive. Mom navigated us off of the freeway and to the nearest Starbucks, but as we eased into the teeny parking lot, we gasped. The line of people stretched out the door of Starbucks and wrapped halfway around the parking lot. And there were even more cars in drive-through line, which spilled out into the adjacent street. Apparently, we weren’t the only ones who needed coffee for our post-holiday road trip! We quickly came up with a Plan B, and as my parents inched out of that parking lot, narrowly avoiding two near accidents, I watched as customers occasionally slipped out of the shop, big mugs of steaming coffee or tea in one hand and a little brown pastry bag in the other. 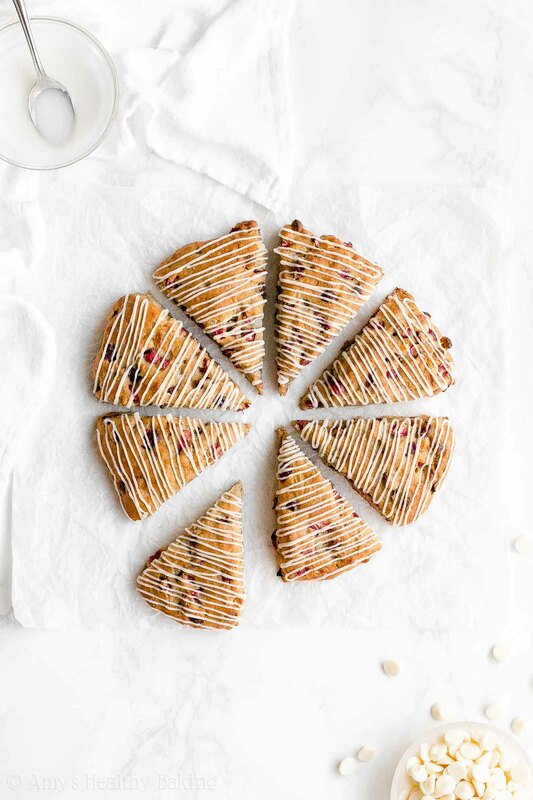 I laughed as more than one person reached into their paper bag and pulled out festive holiday sweets like gingerbread cookies and cranberry bliss bars—definitely more desserts than breakfast foods! 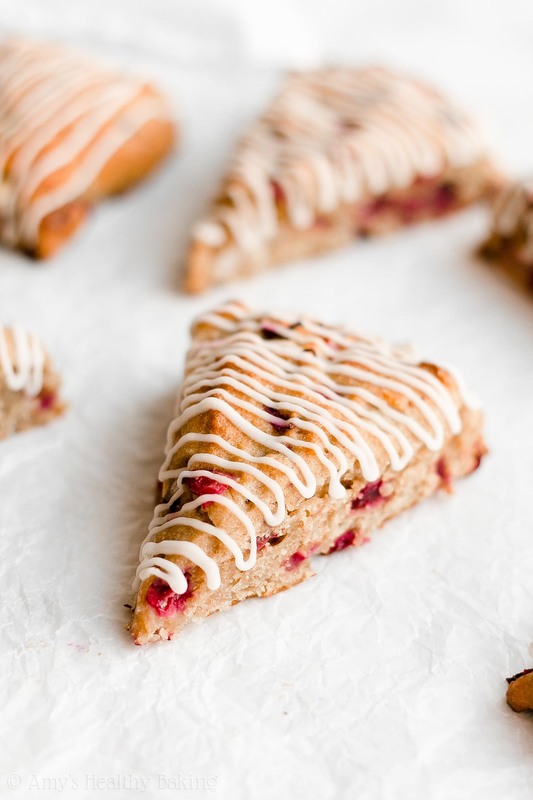 But these Healthy Cranberry Bliss Scones combine the best of both worlds! 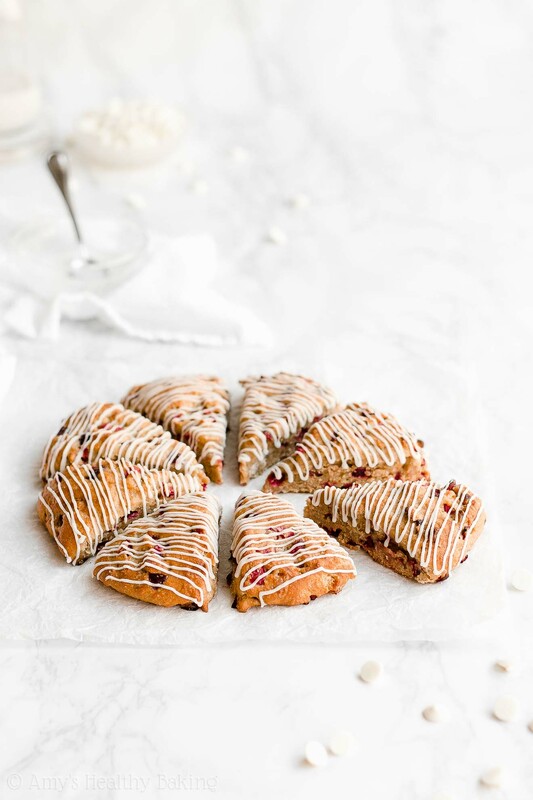 You taste those same iconic holiday flavors as in Starbucks’ cranberry bliss bars: cozy ginger, bright cranberries, rich white chocolate, and a sweet cream cheese drizzle. 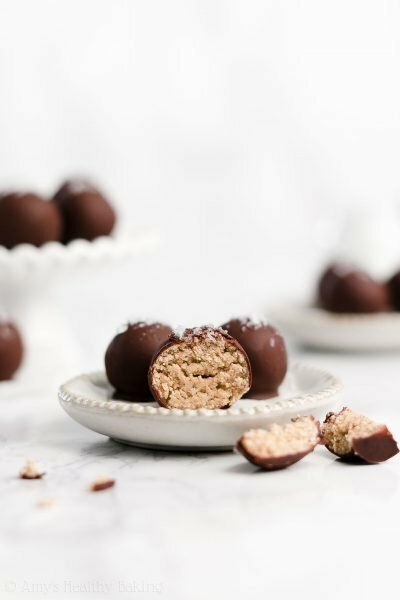 Yet these contain no eggs, refined flour or sugar, and they won’t give you a sugar crash an hour later! Plus they’re just 145 calories! Kind of like a holiday miracle, right? ? 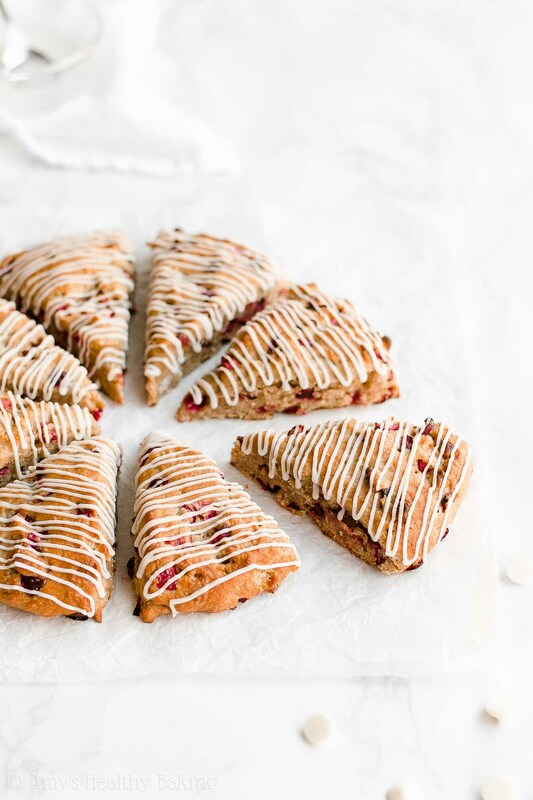 So let’s go over how to make these healthy cranberry bliss scones! You’ll start with whole wheat pastry flour (like this!) and ground ginger. Although Starbucks’ cranberry bliss bars don’t seem to contain too much ginger, just enough to taste, I love its cozy flavor, so I added a teeny bit more. It makes a big difference in the flavor department! 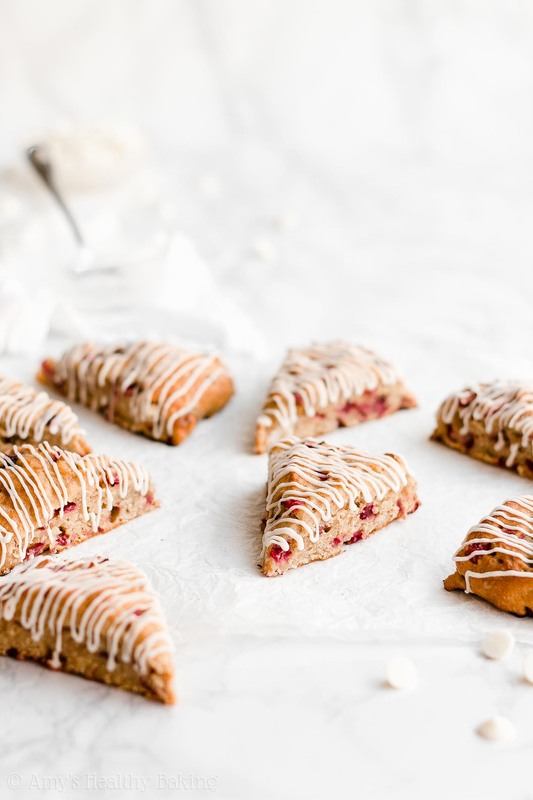 As for the whole wheat pastry flour, it has a lighter taste and texture than regular whole wheat flour, which makes it perfect for these healthy cranberry bliss scones! It lets their soft and tender texture truly shine, along with their classic holiday flavors. Yet it still has the same health benefits (like extra fiber!) as regular whole wheat flour. I call that a win-win! Next, you’ll mix in a small amount of very cold butter. Although many traditional scone recipes call for a full stick or more (plus heavy cream! 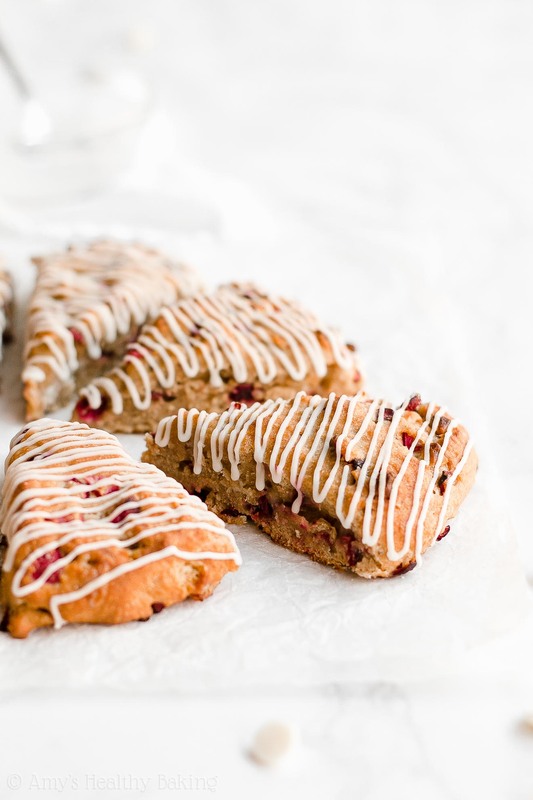 ), you just need 1 tablespoon for these healthy cranberry bliss scones. That really helps keep them low calorie and low fat! And yes, the temperature of your butter does matter! It should be cold and straight from the fridge. (Freezing isn’t necessary for this recipe!) When the butter melts after you put the scones in the oven, it creates tender little pockets in the dough. If it softened or melted ahead of time, you’d miss out on that supremely moist and tender texture! 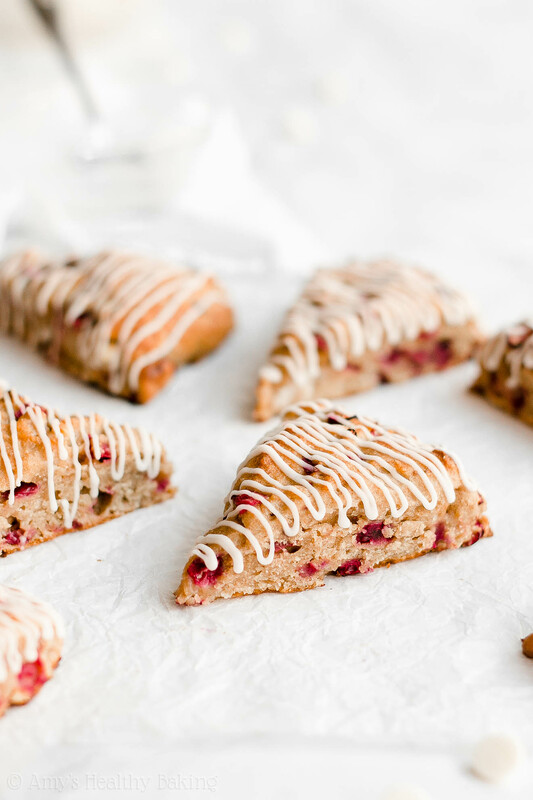 Then instead of heavy cream, like in many traditional recipes, you’ll actually use Greek yogurt in these healthy cranberry bliss scones! If you’ve browsed through my recipes before, then you probably know how much I love baking with Greek yogurt. It adds the same moisture as extra butter to your dough but for a fraction of the calories, and it gives your scones a protein boost too! 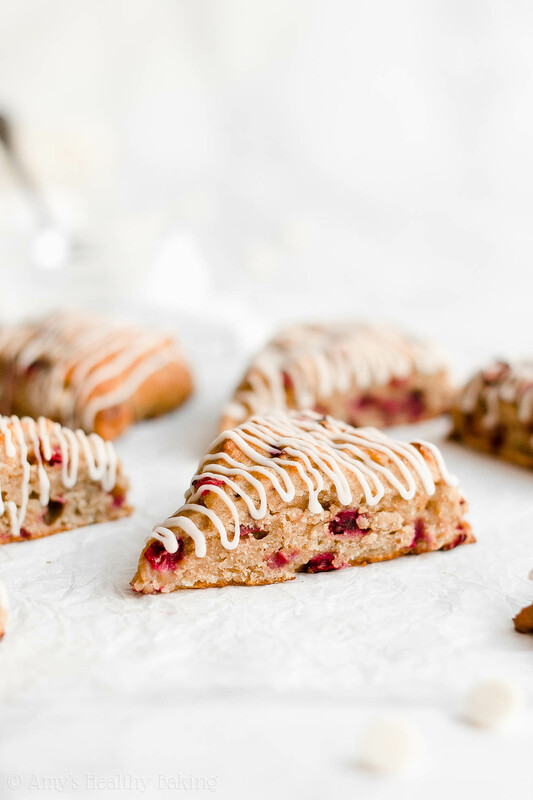 You’ll skip the refined sugar and sweeten your healthy cranberry bliss scones with pure maple syrup instead. It should be the kind that comes directly from maple trees! The only ingredient on the label should be “pure maple syrup,” and it usually comes in thin glass bottles or squat plastic jugs (like this!). Once you’ve transferred the dough onto your baking sheet and shaped it into a circle with a spatula, you’ll brush the tops and the sides with milk. This seals moisture into the dough, and it also creates a hint of a crust on the outside. I love that subtle texture contrast! Note: I went pretty minimalist with my drizzle because I wanted the cranberry and ginger flavors to shine. If you prefer more drizzle, you can easily double the ingredients to add more—or completely cover the tops of your scones in it instead! Now how’s that for a festive holiday breakfast? And when you make your own, remember to snap a picture and share it on Instagram using #amyshealthybaking and tagging @amyshealthybaking IN the photo itself! (That guarantees I’ll see your picture! ?) I’d love to see your healthy cranberry bliss scones! These festive scones are perfect for the holidays! 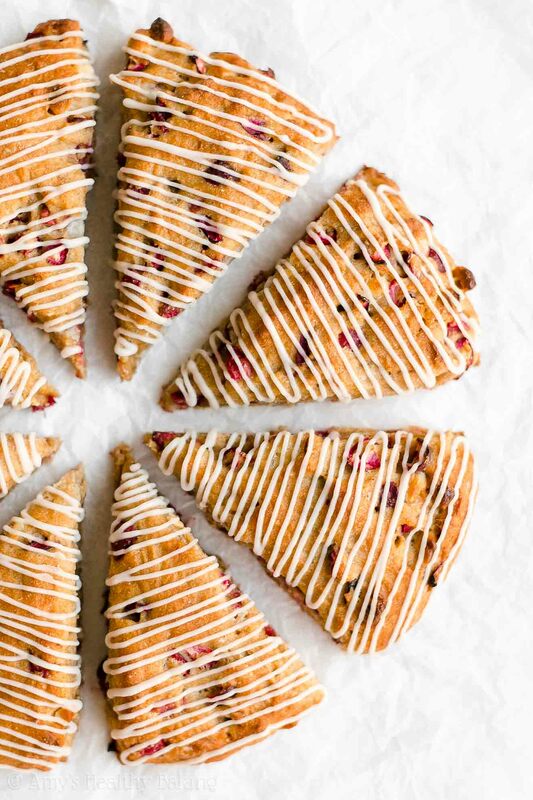 They have the same iconic flavors as Starbucks’ cranberry bliss bars: warm ginger, bright cranberries, rich white chocolate, and a sweet cream cheese drizzle. Plus they’re supremely moist and tender, just the way I love my scones! They’re best if eaten the same day that they’re drizzled, but leftovers will keep for at least 3 days (if not longer!) if stored in an airtight container in the refrigerator. To prepare the scones, whisk together the flour, baking powder, ginger, and salt in a medium bowl. Cut in the butter with a pastry cutter (highly recommended!) or the back of a fork until the mixture resembles fine crumbs. Make a well in the center. Add in the Greek yogurt, maple syrup, ¼ cup of milk, and vanilla. Stir until just incorporated. Gently fold in the cranberries and white chocolate with a spatula. Transfer the dough to the prepared baking sheet. Using a spatula, shape the dough into a ¾” tall circle, and brush with the remaining milk. Slice the dough into 8 triangular segments with a sharp knife. (No need to separate them!) Bake at 425°F for 26-29 minutes, or until the tops and sides are lightly golden. Cool on the pan for 5 minutes before transferring to a wire rack. To make the drizzle, stir together the Greek yogurt cream cheese, milk, and stevia in a small bowl. Transfer the mixture to a zip-topped bag, and cut off a tiny piece of one corner. Just before serving, drizzle on top of the scones. Notes: White whole wheat flour, regular whole wheat flour, or all-purpose flour may be substituted for the whole wheat pastry flour. 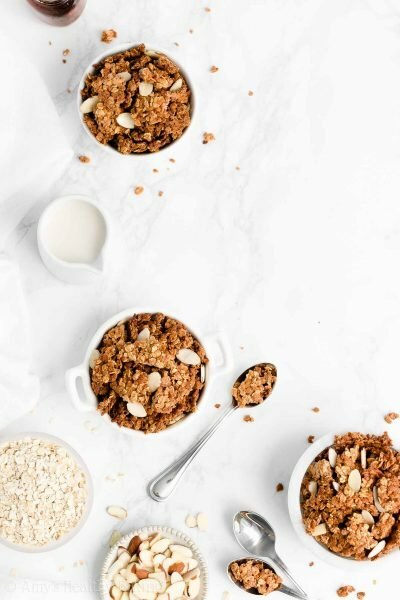 For a gluten-free version, use the following blend: 1 cup (120g) millet flour, ¼ cup (30g) tapioca flour, ¼ cup (30g) brown rice flour, and 1 teaspoon xanthan gum. Most store-bought gluten-free flour blends (like this one!) will work as well, if they’re measured like this. I prefer a stronger ginger flavor, so I increase it by an additional ½ teaspoon (for a total of 1 ½ teaspoons). If you prefer to use dried cranberries, substitute ¼ cup (40g), but hydrate them first! Add the dried cranberries to a microwave-safe bowl, and add enough water to completely cover them. Cover with a lid or plastic wrap. Microwave on HIGH for 1 minute. Let the dried cranberries sit for at least 10 minutes before draining and folding into the dough. If using white chocolate chips, I recommend chopping them a bit so the white chocolate is more evenly dispersed throughout the scones. 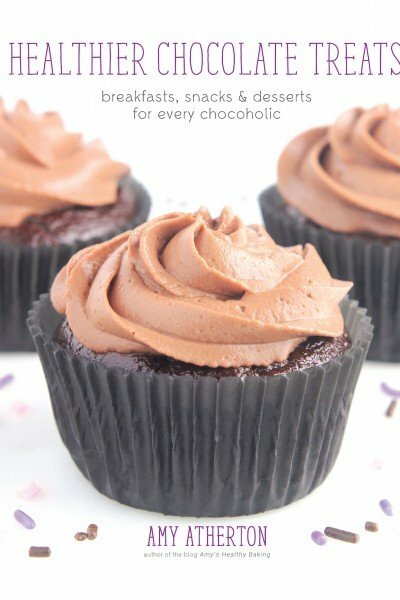 For a truly “clean eating” version, substitute chopped dark chocolate in place of the white chocolate. Regular cream cheese or Greek yogurt cream cheese may be substituted for the neufchâtel cream cheese. In the drizzle, 1 teaspoon of pure maple syrup may be substituted for the liquid stevia. Decrease the milk to ½ teaspoon, or omit the milk altogether. In a pinch, coconut oil may be substituted for the butter, but the texture of the scones will be affected. Very cold butter is required to achieve their tender texture, and since coconut oil melts at a much lower temperature, the results will not be the same. For a vegan version, I recommend Earth Balance sticks in place of the butter, your preferred non-dairy yogurt in place of the Greek yogurt, non-dairy milk in place of the nonfat milk, and vegan-friendly white chocolate. 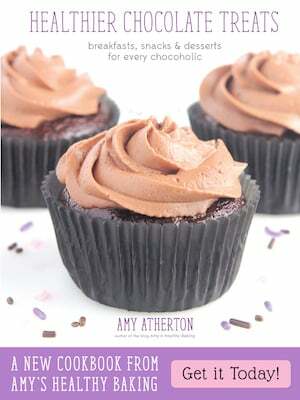 ♡ …and the rest of Amy’s healthy cranberry recipes! Looks delicious! Can’t wait to try them. One question- is there any I can sub for neufchatel cheese (isn’t that cow based cheese? Looking for sheep substitute). Your notes are so valuable and make it much easier to adapt recipes for individual needs. I really appreciate your interest in my recipe Babs! That means a lot to me that you think the Notes sections are so valuable. Thank you! 🙂 Is there a sheep milk substitute that’s similar to cream cheese? Or maybe a sheep milk product that’s similar to the texture of thick Greek yogurt? I’ve never thought to look at the grocery store! If you prefer to use dried cranberries, substitute ¼ cup (40g), but hydrate them first! Add the dried cranberries to a microwave-safe bowl. Cover with a lid or plastic wrap. Microwave on HIGH for 1 minute. Let the dried cranberries sit for at least 10 minutes before draining and folding into the dough. What am I hydrating them in, just water or can I use cranberry juice or some other liquid? Yes! You can use water to cover them before placing them in the microwave. I’ve done this for other recipes. I haven’t tried using a juice, but technically it should work; water is definitely most common. I also have placed my cranberries in a measuring cup, boiled water in my kettle, poured enough hot water to cover the cranberries completely, then let them sit for about 5 minutes while I mix up the rest of the ingredients for the recipe. This works great for any dried fruit you need to rehydrate. Good luck! Thanks for chiming in Lily! 🙂 I’d love to hear what you think of these scones if you try them too! Thanks for catching that typo Janet! All fixed! 🙂 I can’t wait to hear what you think of these scones if you try them! Do you have other recipes using this flour.? Yes!! I have so many recipes that can use whole wheat pastry flour — over 400! You can find them here. Even if whole wheat pastry flour isn’t explicitly listed in the Ingredients list, it’s almost always an acceptable substitute, and I always mention that wherever it applies in the Notes sections of my recipes (located directly underneath the Instructions). 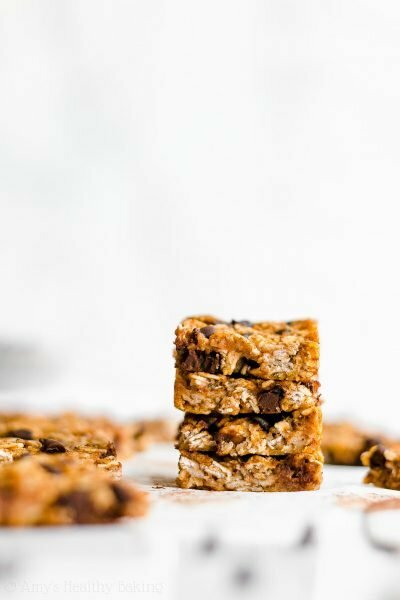 I promise it isn’t a one-time-use ingredient — I try to avoid ingredients like that as much as possible! 🙂 I’ve also included a few other options besides whole wheat pastry flour in the Notes section of this recipe, if you’re interested. I can’t wait to hear what you think if you try these scones Sylvia! Amy these look amazing!!! I’m super excited to make them. 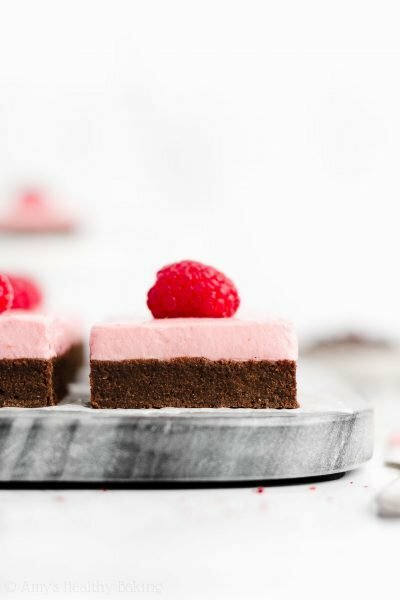 I love the cranberry bliss bars but find them a bit too sweet so this version looks better to me! I can’t believe I missed that. Thank you.